With her furious, instantly identifiable flowsand her unapologetic determination to break out of the lane she was trapped in, Cardi B is already doing a great deal to shake up hip-hop. Why See BET Experience - Saturday (Cardi B, Migos, Lil Yachty, Lil Baby)? The ultimate music, celebrity and lifestyle weekend festival is back for its seventh year running and its headliners are bigger than ever. Built around the Black Entertainment Television network's annual awards ceremony, the four day spectacular combines seminars, panels and convention-style activities, with Friday night and Saturday night music concerts topping the chockablock bill! On Saturday night, catch-phrase toting, hip hop superstar Cardi B is set to shake the very foundations of the Staples Center alongside fellow chart dominators Migos, rising bubble gum trap rapper Lil Yachty, Atlanta rapper Lil Baby and Miami hip hop duo City Girls. First courting the spotlight as a regular on VH1 reality show 'Love & Hip Hop: New York', Cardi B turned her 15 minutes of reality fame to a fully-fledged career in music when she broke records by earning three number one singles on the Billboard Hot 100 chart. 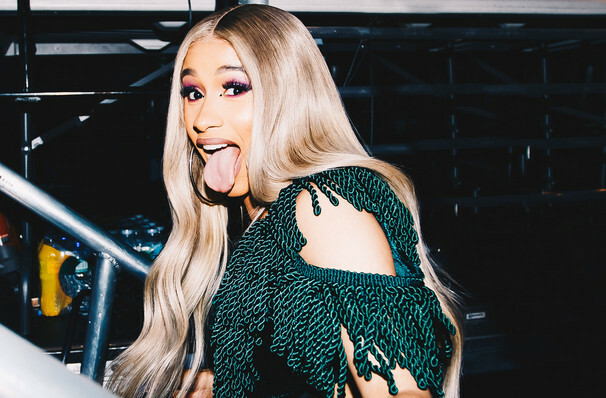 Her debut album Invasion Of Privacy, released in 2018, earned her the Grammy that same year for Best Rap Album, making her the only female solo artist to receive at accolade. Sound good to you? 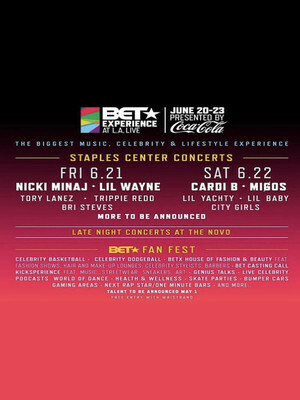 Share this page on social media and let your friends know about BET Experience - Saturday (Cardi B, Migos, Lil Yachty, Lil Baby) at Staples Center. Please note: The term Staples Center and/or BET Experience - Saturday (Cardi B, Migos, Lil Yachty, Lil Baby) as well as all associated graphics, logos, and/or other trademarks, tradenames or copyrights are the property of the Staples Center and/or BET Experience - Saturday (Cardi B, Migos, Lil Yachty, Lil Baby) and are used herein for factual descriptive purposes only. We are in no way associated with or authorized by the Staples Center and/or BET Experience - Saturday (Cardi B, Migos, Lil Yachty, Lil Baby) and neither that entity nor any of its affiliates have licensed or endorsed us to sell tickets, goods and or services in conjunction with their events.